The M90 palm-size PLC/HMI integrated device is specifically designed for users requiring micro-PLCs to automate small systemswhich need an HMI operator interface. 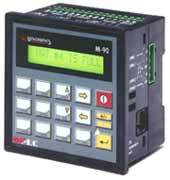 Unitronics Industrial Automation Systemsm-size PLC/HMI integrated device is specifically designed for users requiring micro-PLCs to automate small systemswhich need an HMI operator interface. The all-in-one device provides a solution that reduces overall system engineering. The company produces the M90 in four models encompassing a variety of features: digital/analog onboard I/Os, high-speed counter/shaft encoder, CANbus/RS232 communications, real-time/date control, and I/O expansion rack port. All models can be panel or DIN rail mounted. The unit contains an HMI operator panel comprising an LCD display screen and keypad. The screen displays user0defined operator instructions and dynamic system data. The operator uses the programmable keypad to enter data into the system and to initiate functions. ConBee U90 software provides a Windows environment for the creation of both the PLC control program, written in Ladder, and the HMI operator interface. The M90 package includes the M90, ConBee software, program download cable, mounting hardware, and manual. , P.O.B. 733, Lod 71106, Israel. Tel: +972-8-9212555. Fax: +972-8-9213888.